Properly sited and functioning septic systems are an efficient way of handling drained wastes from the bathroom, kitchen, and laundry area. However, because there are potential health risks associated with these wastes, owners are responsible for proper operation and maintenance. So, let's become familiar with how the septic system works. How it works: Waste from the house first enters a tank where relatively solid materials settle to the bottom of the tank as sludge and are somewhat digested by bacteria. Light particles like grease and fat rise to the top of the tank as scum. When the sludge and scum layers get too thick they must be pumped out. The liquid between these two layers, called "effluent," goes through two tank chambers for separation from the solids. While it is in the tank, anaerobic bacteria eat and digest the suspended food and waste particles in the liquid, which makes it easier to then move to the drainage field for the major purification. The real treatment occurs in the drainfields, which are 2-5 excavated trenches with a foot-thick layer of washed gravel around perforated distribution pipes. The trenches are covered with soil and shaped to keep any water from ponding over the fields. The effluent that flows into the perforated pipes and into the trenches still contains disease-causing germs and possibly other pollutants. As it seeps through the soil, however, many of the bacteria, viruses, and certain chemicals are filtered out or absorbed by the soil. Obviously, soil type is crucial for proper treatment. It should not be too sandy nor too clayey. You do not want rock or soil layers that restrict the downward flow of water. What happens to the solids in the tank? They accumulate, and accumulate, and accumulate. Eventually they will overflow into the drain fields and clog the pores in the soil. Then the septage either backs up into the house or it flows across the surface of the ground. Either situation is a health hazard. Besides, once the pores of the soil have been plugged by sludge, the drainfields cannot be rejuvinated. You'll need to create additional drainfields if you have enough property. How do you know when the tank needs to be pumped? It depends upon the size of your tank and the amount of wastewater you are putting in your system. Checking your tank yearly for the rate of solids is a good practice. The sludge layer should not be allowed to become greater than 33% of the liquid capacity of the tank. If you have a 1,000 gallon tank and 4 people using the system, the tank should probably be pumped every 3 to 5 years. Do you know where your septic system is located? Many persons don't. It is good practice to measure and map the location and keep this information with important papers about your house and property. By law, all sewerage, seepage pits and drainage fields must be 100 feet from the mean high water mark of a stream, river, pond or lake. Miracle Additives? You've seen the advertisements, or the person that pumps your septic tank has tried to sell it to you: The additives that promise to restore/save your septic system and prevent costly repairs. According to the engineers it's worthless. It's just a dehydrated septic tank sludge that you're being asked to pay big bucks for. The bacteria and fungi in your own tank are just as good, if not better, than anybody else's. Just be careful you don't kill your bacteria and fungi by putting in things like Drano. Nearly a million households in Pennsylvania rely on private water supplies. In Pennsylvania, protection and maintenance of a private well is largely the responsibility of homeowners. Private wells are typically safe, dependable sources of water if sited wisely and constructed properly. 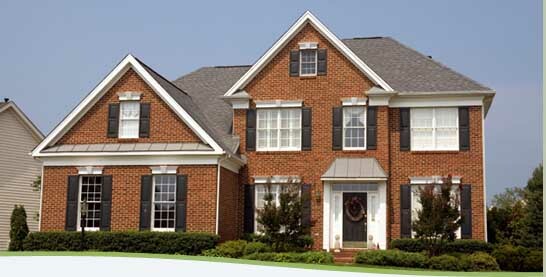 Information is provided here to have your private water supply built correctly and protected adequately. Drilled wells. Drilled wells are constructed by either cable tool (percussion) or rotary-drilling machines. Drilled wells that penetrate unconsolidated material require installation of casing and a screen to prevent inflow of sediment and collapse. They can be drilled more than 1,000 feet deep. The space around the casing must be sealed with grouting material of either neat cement or bentonite clay to prevent contamination by water draining from the surface downward around the outside of the casing.adequately. Dug wells. Historically, dug wells were excavated by hand shovel to below the water table until incoming water exceeded the digger's bailing rate. The well was lined with stones, bricks, tile, or other material to prevent collapse, and was covered with a cap of wood, stone, or concrete tile. Because of the type of construction, bored wells can go deeper beneath the water table than can hand-dug wells. Dug and bored wells have a large diameter and expose a large area to the aquifer. 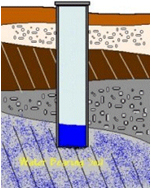 These wells are able to obtain water from less-permeable materials such as very fine sand, silt, or clay. Disadvantages of this type of well are that they are shallow and lack continuous casing and grouting, making them subject to contamination from nearby surface sources, and they go dry during periods of drought if the water table drops below the well bottom.